In order for us to install an Android app to your Amazfit Pace, please complete the specified requirements below. 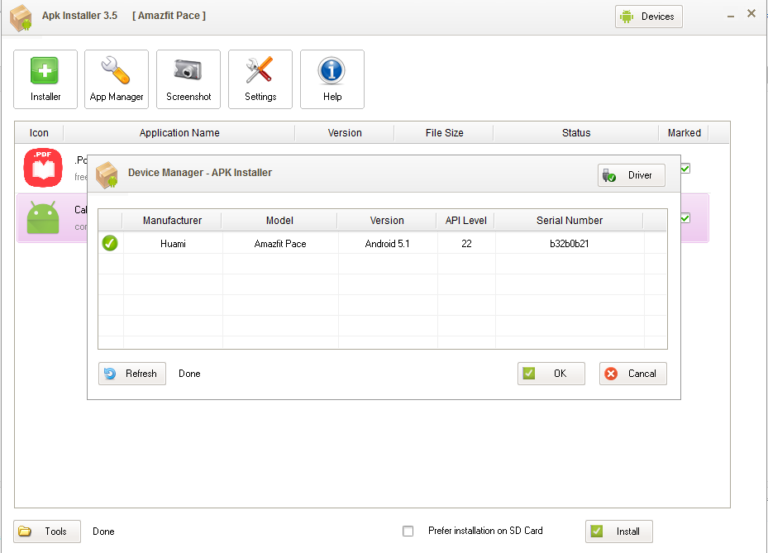 Download the ADB driver just in case the Android app installer will not be able to detect your Pace device. Choose the ADB Driver Installer (Universal) Automated install universal adb driver. If you download all the files, you can start uploading the app now to your Amazfit Pace. Here are the step by step process. Open the APK Installer, click the button “Device” on the upper right side of the window, a window will appear, if your driver is installed properly, the Amazfit Pace device will show up on the list of devices. If not, follow the instructions below (#A), before proceeding to step 2. Once you device is detected, it’s time to load your Android apps, click the button “Tools” on the left bottom part of the windows, select “Open APK files”, locate and load your Android apps. Once the APK has been loaded in the windows, select the install button on the bottom right part of the application. That’s it, you have successfully install an APK file to your Amazfit Pace, check the installed watchface in your Amazfit Pace.